Review #9173750 pacific beach cottage Thank you so much PBVR. This rental is perfect for my mother and I to relax at the beach or bay and do some shopping. The cottage is beautifully updated and has everything you need for a comfortable stay. Very clean and perfect amount of space for 4 people. I am highly impressed and so is my mother. She is hard to please, points for me!!!! Double points for PBVR!!! Review #5656798 Beautiful Place Perfect Location Great Staff !!! Group of friends came in town from KS,OK,AZ and TX for a wedding. Looked at several places to stay online until I found Jenny at Blue Water Vacation Homes. She pointed me in the direction of the Surf and Sand rental after listening to the our needs. It was the perfect place for us !!! Right on the beach, BBQ on balcony, slept 8 and nice flat screens which were perfect for the football games on that Sunday. The rental was extremely clean and everything in there was up to date if not brand new. It's a great place for entertaining. The top floor has an open floor plan so it was nice having everyone together while we were cooking and enjoying the ocean view. Couldn't have asked for a better place for our needs. Jenny made everything so easy from picking out the place,checking in, paperwork, along with checking out. Will definitely use the service again with another trip coming up soon. Reviewer Location: Saint Petersburg, Russia - Date of Arrival: September 26, 2015 - Review#: 13455403 "Perfect quality price rate!!!" - Review Rating: 5 out of 5 stars - "Optimal for staying for families with children. Fully equipped in really good condition, quiet surroundings, very pleasant district, 4 blocks to ocean beach." (NOTE - when guest mentions "ocean beach" this is referring to the ocean of Pacific Beach). Reviewer Location: Grand Junction, CO - Date of Arrival: October 4, 2015 - Review#: 13345353 "Great Mission Beach Condo" - Review Rating: 5 out of 5 - "We brought the family out to Mission Beach for fall break and stayed at this condo for the week. We were very pleased with it's location and proximity to the beach. It was literally 20 steps to the sand. The condo was in good condition. The bedrooms were spacious, especially the master suite with the on-suite bath. The living area was open-concept with a pull out couch and fold down futon, so plenty of room. They had some beach gear available including an umbrella which was nice. The unit had a warm water shower head and hose outside the door to easily clean off sand. The parking was tight, but by the end of the week we were pretty good at negotiating the space. The Beaumont Park was in walking distance which had lots of shopping, rides and carnival type games for the kids. We rented boogie boards one day for the beach and that was fun. There are several shops in walking distance on the beach for such rental needs. I would recommend this condo for anyone, especially families." Reviewer Location: Rio Bonito, Rio de Janeiro - Date of Arrival: February 5, 2016 - Review Rating: 5 out of 5 stars - Review Title: "Excellent" - Review: "Never had rented before the internet and was worried .The unit rented at Blue Water was exactly as we saw on the internet, cozy and extremely clean. The professionals at Blue Water helped me before the trip to information from the district 's and all other doubts. When we had arrived early in the morning we never had a doubt and they cared for us even through the early hours. they responded very well .Prendemos back and rent with Blue Water." "Bluewater is a dream to work with!" 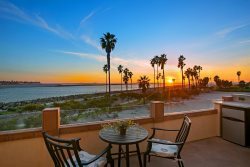 I booked this beautiful vacation home rental on Mission Beach through Bluewater Vacation Homes. The booking process made it very clear what the entire cost of the condo would be and the actual booking was very simple. Kendra Krause was the person with whom I had the most contact and she was exceptionally helpful in this process as I asked her questions along the way. The condo rental was all paid for and we were scheduled to leave in three days when a family member died and we had to cancel the trip. I had not taken out the vacation insurance that was offered to me, so I assumed that I would lose all my money, as the contract stated. Kendra said that she would work extra hard to get the condo re-booked (which seemed impossible considering it was with 3 days notice) and she did! Much to my surprise, she called and said that she had been successful and that we were getting almost all of our money back that we thought we had forfeited. Kendra's and Bluewater's honesty through this process with so refreshing! They could have easily said they hadn't re-booked it or not even tried, but they went well above what I expected of them and promptly and cheerfully refunded our money. I cannot say enough good about this company and Kendra's efforts on our behalf. I will definitely use them again. They were a pleasure to work with all along the way! Review #6353437 Stunning views Beautiful views from nice deck and rooftop sitting area, great kitchen - we had a get-together and everyone fit comfortably and all were impressed. Highly recommend. Reviewer Location: Scottsdale, AZ. Date of Arrival: May 24, 2013. Review Rating: 5 out of 5.
Review #5816084 Terrific Sunsets - We loved our stay at Bluewater Ocean Front right on the Boardwalk at Mission Beach. Wish we could have stayed longer. Review #11154638 Beautiful home with ocean view and garden Our time at this beautiful home was unique and wonderful. The house faces the Pacific Ocean, and directly across the road, theres a staircase that leads to a secluded beach in the magnificent Sunset Cliffs Natural Park. The home is spacious and beautiful, with softly-curved corners and archways, rich wood trim, a hanging wooden staircase, and inspiring art. In nearly every room, sliding doors open to the large, private, and lush multi-level garden, or toward the ocean. The master suite opens to an enclosed terrace with a splendid view of the sea. We enjoyed hearing the waves and breathing the fresh air at night and while using the indoor/outdoor stone shower. Additionally, the master bathroom has a luxurious bathtub and two sinks so you can feel pampered. The kitchen is large with everything you need and has a bar useful for sharing appetizers while getting ready for another amazing sunset. The living room is a comfortable and inviting place to read and relax. One of our favorite things was that there were many special places in the home and garden where you could sit and enjoy the sunlight coming in while getting lost in a novel, or do some yoga, or have a quiet conversation. Each nook has its own view and perspective. We truly felt relaxed and refreshed after our time here. Review #5119764 Ideal ocean cottage getaway Looking for a weekend away from Los Angeles stress, a friend and I set out to La Jolla to find haven near the water. We expected the 8001 Ocean Lane property to be the ideal getaway but had no idea it was going to be as marvelous as it was. The listing photos and description do not do justice to the serene and charming atmosphere of the place. It was brilliantly clean with all the necessary amenities and left us beaming with delight at the door, fearing that if we walked too far in it would end up being a dream. The surrounding area has a variety of shops, cafes, and attractions that are just blocks away making exploring easily accessible. Yet, even with the town center being just up the street, there is little rowdy foot or vehicle traffic around the cottage providing the perfect feeling of comfortable seclusion. The area and shops are incredibly welcoming, relaxing, and fun look for smiling servers and delicious treats at Cups cupcakery! I highly recommend the cottage to any friends, family, partners, or individuals looking for a beautiful and accommodating place to stay in the La Jolla area. Review #7512822 Beautiful home! We stayed at this beautiful Beachfront property for Spring Break and truly loved everything this home had to offer! Highly recommend it to any family. Pleasantly surprised to find another room behind the garage which was great for our teenage daughters. Home has all the amenities one needs. We loved the brick fire place on the front porch in the evenings while we sat and listened to the ocean. Working with BlueWater company was wonderful and easy! We will definitely be back to this beautiful home! So hard to leave.